Bergen, city where it always rains. At least, that's one of the first things Norwegians think about if you ask them about this place. We can partly agree with the statement. However, a bunker trip to this part of Norway will never be a disappoinment. First you have the heavy MKB Fjell which is worth the journey to Norway itself. 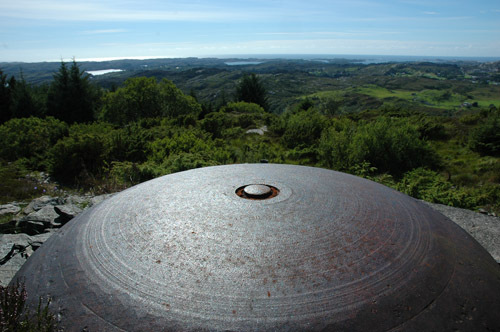 Then there are the smaller coastal and Flak batteries located on the best spots. Besides the guns, Bergen was also an important U-Boot base with even its own U-Boot bunker and lots of headquarters in town. Special thanks to Paul Sedal and Dag Mjelde who both literally and figuratively speaking opened doors for us in Bergen. Thanks to Roy de Bruijn, Peter Heijkoop and Erik Ritterbach for helping me planning this trip. View from an observationcupola at Fjell over the peninsula.